Oregano, also known as Wild Marjoram or Spanish Thyme, is an important culinary herb native to Eurasia and the Mediterranean. It is a major constituent of the Mediterranean diet. Botanically, this herb is called Origanum vulgare. Apart from adding flavor to the food, oregano also provides a number of health benefits. It is mostly used to treat respiratory tract disorders such as asthma, bronchitis, cough, etc. Moreover, it helps relieve bloating, heartburn, menstrual cramps, urinary tract disorders, and the same. It also fights against bacteria, viruses, fungi, parasites, and intestinal worms. Oregano is excellent for your brain too. Let’s find out how. It boosts your brain power and improves your mental wellbeing. It is believed that this herb has antioxidants that protect against neuronal damage. A study published in the British Journal of Nutrition and presented at the International Society of Neuroscience conference in New Orleans found that oregano has potential mood enhancing benefits that can be attributed to its active compounds, carvacrol and thymoquinone. The researchers administered capsules containing different intakes of oregano extract to 20 young healthy men aged 18 to 45. The extract was given two times a day for five days. This caused a noticeable increase in the alpha-1 and beta-1 brainwaves in the subjects. Alpha-1 brainwaves induce relaxation, reduce anxiety, and improve learning and concentration. In addition, an increase in beta-1 brainwaves is associated with higher levels of cognitive processing and alertness. The oregano extract also demonstrated to exhibit positive behavioral response in animals, similar to those caused by monoamine-enhancing compounds in humans. The oregano extract inhibited the reuptake and degradation of monoamine neurotransmitters (serotonin, dopamine and noradrenaline). These monoamine neurotransmitters are responsible for regulation of sleep, appetite, and modulation of mood, anxiety, and cognition. A study by the Aristotle University of Thessaloniki in Greece revealed that the antioxidants present in oregano, rosemary or vitamin E offer protection against neuronal damage. Oregano has a long history of medicinal use as it contains natural oils and chemicals like thymol, pinene, carvacrol, caryophyllene, and others. In addition, it is packed with iron, manganese, calcium, omega-3 fatty acids, vitamins C and K, and fiber. 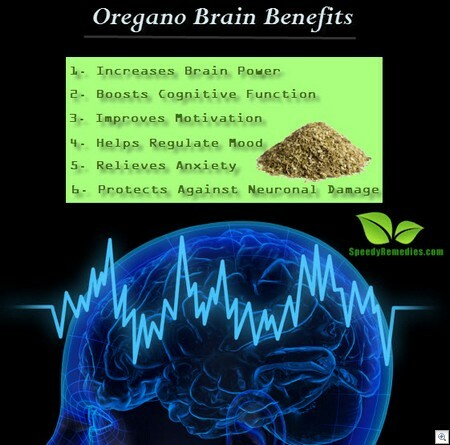 Manganese, in particular, also contributes to the brain benefits of oregano. The deficiency of this essential trace mineral may affect manganese homeostasis in the brain and cause alteration of neural activity. Plus, omega-3 fatty acids also benefit brain health and help your brain age better. Researchers have found that diets lacking or with reduced intake of this essential fatty acid are associated with higher risk of age-related cognitive decline or dementia. Also, omega-3 fatty acids can help relieve depression. In addition, oregano has potent antioxidant properties that fight against cancer and heart disease. A report published in the Journal of Nutrition indicates that this herb contains a high concentration of antioxidants. In fact, it has been found that its antioxidant activity is 42 times more than that of apples, 12 times more than that of oranges, and four times more than that of blueberries. So, include this herb in your recipes to enhance their flavor as well as brain benefits. It usually matches well with tomatoes, potatoes, sausages, zucchini, beans, artichoke, eggplant, mushrooms, pepper, chicken, pork, fish, lamb, pizza, spaghetti, marinades, etc. You can store fresh oregano in the refrigerator for up to three days. Make sure you keep it in a plastic bag. Dried oregano can be stored in a cool, dark place up to six months. However, those who are allergic to basil, mint, sage, lavender, and other plants from the Lamiaceae family may be allergic to oregano, too. Moreover, it may lower blood sugar levels and interact with drugs such as anticoagulants and hormonal agents.